Programs are presented via PowerPoint and can be tailored to your group to contain a hands-on component conducive to a workshop or in-service setting. Programs can be customized to run from 30 minutes to 2 hours. To schedule a program for your group, please contact Becky Laboy, Education Outreach Specialist, Education@Soildistrict.org, or call for more details: 609-971-7002 ext. 114. We will explore soil from a garden’s point of view, compare different soil types, learn about the importance of pH, meet the organisms that live in the soil, and discover why healthy soil is at the root of a healthy garden! Pollinators such as bees and butterflies are crucial to the vitality of our gardens. They adorn our yards and provide important eco-services to humans. Discover ways to create backyard habitat that supports these beautiful creatures, starting with healthy soil. Healthy soil produces healthy food. The unique sandy, acidic soils of the Jersey Shore pose challenges to the home gardener. Learn the needs of your favorite food crops and naturally amend your soil to support their growth. Alternatively, grow and harvest native specialties that thrive in our native soil conditions with little amendment and effort. Composting is a great way to turn your garbage into garden! Essential nutrients in your vegetable food scraps, grass clippings and leaves can be recycled back into the soil. Explore composting techniques for the backyard gardener. Rain Gardens are a natural way to beautify your landscape while implementing an environmentally sound solution to stormwater runoff. This program will teach you the steps involved with creating a Rain Garden and offer ideas for appropriate plant selection. Native plants are adapted to the natural soil conditions, climate and wildlife around them. Learn how gardening with native plants can save you time and money, create a beautiful landscape, and attract wildlife to your backyard. An introduction to the Jersey-Friendly Yards website, www.jerseyyards.org, will offer instant gratification to your challenge of selecting native plants conducive to your garden’s specific soil, light and moisture conditions. Healthy soil is at the root of all life on Earth – including the plants in your garden. Enhance your garden’s productivity by becoming a “soil food web gardener”. By understanding the macro and micro-organisms that live in a balanced underground ecosystem in your soil, you can provide them with the optimum conditions they need to thrive. You’ll reap the benefits of healthy, naturally nutrient-rich soil. The Jersey Shore is a sought-after pace to live, work and play. But our hot summers, cold winters, sandy soils and salt spray can pose many challenges to home gardening and landscaping. This program offers solutions by taking a low-maintenance, eco-friendly approach, and working with the conditions nature offers. Explore and discover ways to landscape your yard and garden with beautiful native plants, water conserving techniques and healthy soil-building strategies. New Jersey Soil is unique! Although sandy, acidic, and nutrient poor, New Jersey soil supports a diversity of plant life. Discover the special adaptations New Jersey’s native plants have to survive in these challenging soil conditions. Explore the possibilities of incorporating these plants into your yard or garden landscape. 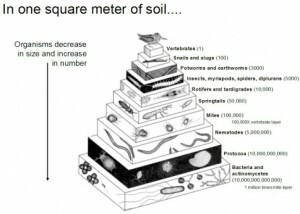 “Assessing Your Soil’s Health” A healthy foundation on which to build your garden is a priority. Soil is that foundation – it provides your plants with mineral nutrients, air, water and a place to grow. But, how do you know if your soil is healthy? A “soil health assessment” can provide you with valuable information about the physical, chemical and biological properties of your soil, and offer solutions to common problems such as compaction, erosion, lack of nutrients, and pH that is too acidic or too alkaline. Discover how to assess your own soil, determine its health, and amend your soil to create a healthier garden. *This program requires an outdoor space in which to conduct a demonstration soil assessment. Do you know the type of soil under your feet? Under your house? Under your town? Knowing the type of soil below, can inform your decisions about what to build or plant above. Soil surveys can be used by gardeners, farmers, and for local area planning. Soil survey information can be used to make informed decisions about gardening and farming practices, home ownership, wetland proximity, and high water table limitations. This program will show you how to access and use the Web Soil Survey to help you get a better understanding of the soil beneath your feet. *This program requires internet access. The underground soil food chain is often overlooked as an important part of the Earth’s Food Web. This program focuses on the intricate connections between soil organisms and the birds they nourish, and provides information for gardeners about how to create healthy soil and a healthy landscape to feed and support our feathered friends.